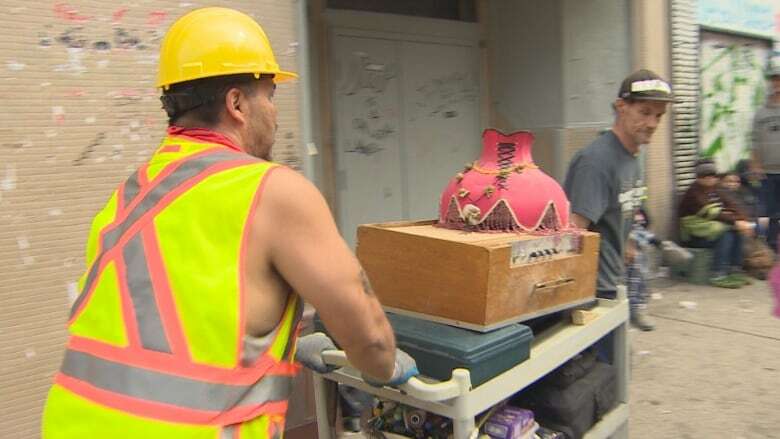 City of Vancouver workers, moving companies and police helped residents of the notorious Balmoral Hotel take their belongings to safer housing. People lined up for hours to receive settlement cheques from the owners. Dozens of people formed a long line outside the derelict Balmoral Hotel in the hopes of receiving settlement cheques from the owners, the Sahota family, after the city deemed the building uninhabitable. Mervin Small Legs was first in line to receive a cheque outside the single room occupancy hotel at 159 East Hastings Street. "Well, I gotta go buy furniture for my new place." Moving trucks and workers with the City of Vancouver helped residents relocate their belongings, which included lamps, guitars, bikes and a hamster. Small Legs received a cheque for $1,575 from Balmoral Hotel Ltd. He will be living in social housing at another location. He says that's better for his asthma than the Balmoral, which has mould problems. A woman who had been waiting to receive money too says she was told the cheques for people living on the sixth floor were not ready yet and she left empty-handed. Ten days ago, the chief building inspector for the City of Vancouver ordered the building's 175 rooms evacuated by today after determining water damage and rot put the hotel at risk of collapsing. An activist group, which calls itself the Downtown Eastside SRO Collaborative, warned the Sahotas that if tenants did not receive their settlement cheques, there would be "war." That battle appeared to be averted as cheques were issued to more residents as the day went on. The group says tenants are eligible for approximately two months rent and the return of their damage deposit back, but there is a condition. It says if residents accept the cheques, they will have to sign a release form, which prevents them from suing their landlords in the future for aggravated damages related to the evacuation. Even so, not everyone has a home despite the city and provincial governments' last ditch efforts to relocate 160 people from the hotel. "Right now, we still have about 16 tenants who don't have housing. 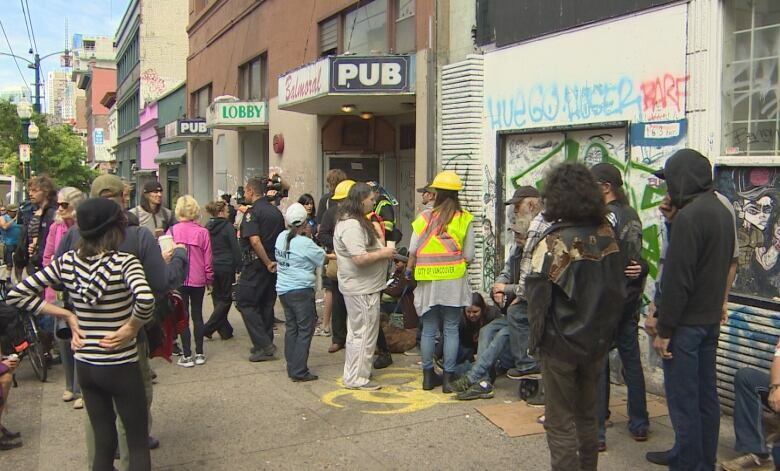 Lots of housing organizations have stepped up to the plate to bail the city out of this predicament," said Eliot Galan, a spokesperson for the Vancouver Tenants' Union. City Hall has been facing criticism for not acting sooner, despite several years of complaints about the hotel. Vancouver Mayor Gregor Robertson says the city's enforcement tools are limited, and the B.C. government doesn't give the city the ability to hand out fines of more than $10,000 to SROs. "A lot of the enforcement that we push to the courts is not effective. It doesn't come back with consequences for the building owners, so this is where there needs to be more teeth." The owners of the hotel have until July 14 to make repairs, according to a city order.